Unknown maker. Size 42R (measures approximately 22" from armpit to armpit). Classic two-tone in dark seal brown leather with lighter sleeve panels and pocket. 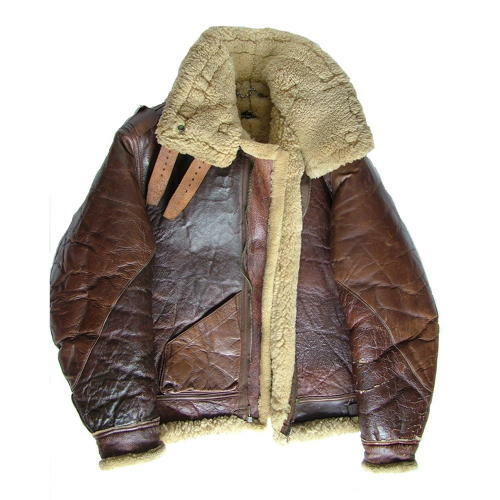 The majority of the leather is in very good condition retaining a super finish and little of the usual crazing and surface peel associated with American shearling jackets. It is a little dry in places but remains quite flexible. However, there are a few areas that have issues. These include some cracking of the polyacrylate finish, notably on the upper right rear panel and the left sleeve. Fortunately the leather is quite thick and remains good and strong. Further cracking on the cuff of the same sleeve is a little deeper and there is a small 'split' on the back of the collar. The jacket retains the front patch pocket, excellent supple straps/buckles at the waist and collar, chain hanger and label. The fur lining is also very good. Sadly the zip that has broken and requires replacement. This good looking jacket is relisted as availble once more due to unforseen circumstances. Stock code J222272.